« Winter: Please Let Me Outta Here! Local Deer Get Through Winter In Good Shape! I was on the way home from my grand daughters birthday party when I saw these five deer moving from the woods in search of something to eat. The funny thing is, they aren’t but a couple hundred yards from the country subdivision I live in, and are feeding directly toward my house. The last deer in this group seems to be larger than the others, and I would bet it’s a buck. I have lived for 16 years in this area, and seen some deer sign, but these are the first deer I have actually laid my eyes on! I’m glad there are some roaming around, and I hope to see more in the future. Can’t wait for those fields to be green instead of white. Temps. have been in the high 40’s the last couple days and most of the snow is gone. I’m not missing it one bit! I need some warm sunny weather to get those lovesick Tom’s looking for a mate. Sometimes the first turkey hunt can be somewhat disappointing, as the birds may be “late” due to cold weather conditions. I only have about three more weeks before my hunt starts. Well at least a couple of the grandkids have the later hunt, which might end up being the best hunt! This entry was posted on Tuesday, March 21st, 2017 at 10:30 am and is filed under Uncategorized. You can follow any responses to this entry through the RSS 2.0 feed. Both comments and pings are currently closed. If one wants to see local deer and plenty of them, around dusk or a little earlier head out Stewart Road west of Telegraph and look South toward the woods, this is across from the area of Arbor Creek Subdivision. They are closer to the woods than the road, I counted 12 while driving and still had more to count before I had to focus back on driving. This is just outside the city limits as well. I have seen them in that area for the past several months. My neighbor hunts back there and took a beautiful 8 point two years ago! 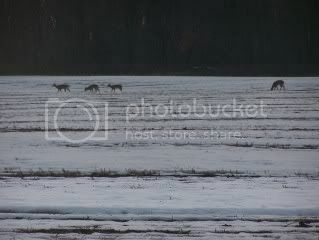 After reading about the coyotes in Lenawee County and how they are decimating the fawns there, it is only a matter of time before they need to follow their food source and that will lead them to our area when it gets low. I don’t want to say that we have an abundance of deer and wild turkey but there are more of both of these around here within the last couple of years than previously and they will be hit hard if the coyotes are not kept in check next door as well as in Monroe County.